St Andrews Chauffeur offer Chauffeured Airport Transfers, exclusive small group Private Tours, Day Tours and chauffeured Golf Transport throughout Scotland and the Scottish Highlands. 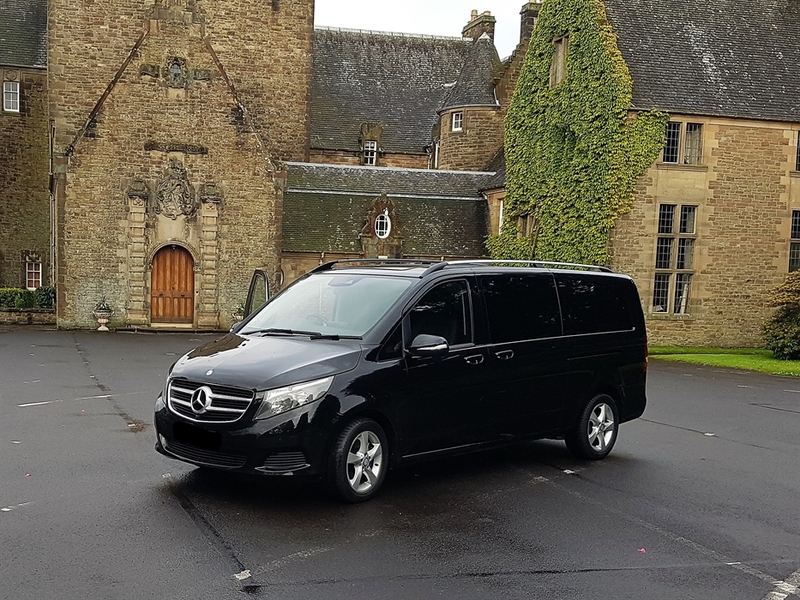 Our luxurious chauffeur driven Mercedes - Benz V Class ( 7 passengers) or Mercedes - Benz S Class (3/4 passengers) have Wi-Fi, full air conditioning and complimentary Highland Spring water included. Arrangements can be made for a personalised half day tour, a full day tour, or several days visiting the attractions and areas of your choice with an experienced friendly driver, every tour is unique to you, where you decide how long you want to stay. Day Tours of St Andrews, the " Home of Golf " are available as half or full day, visit the picturesque fishing villages around the East-Neuk coast-line and enjoy the view from the Royal and Ancient clubhouse which looks out over the world’s most famous and most challenging golf course, the Old Course. St Andrews is home to Scotland’s oldest university and the site of the most magnificent cathedral and castle ruins. Kingsbarns Distillery and Eden Mill Distillery can be visited on a half day tour. Day Tours of Edinburgh, Loch Ness, Inverness & the Scottish Highlands can be arranged on request. Whiskey Tours & Sightseeing Tours can take you through some of Scotland's most beautiful and spectacular countryside, on the way you will pass many of the historical and cultural sites that are among the best our country has to offer.The wide and varied collection of interesting places that you can visit depends upon how long you spend at different places and the distance between the various attractions, it may not always be possible to visit all the places of interest on every tour as some attractions may close earlier in the season. Tours of longer than one day can start anywhere in Scotland that suits you. Private Golf Transport is available for visitors to Scotland's Golf Courses and can be made available for the duration of your stay in Scotland. This arrangement suits golfers who wish to plan their own games and make their own choice of courses. Our 8 seater luxury Mercedes- Benz V Class can easily take 4 golfers with clubs and luggage in comfort. Your personal chauffeur will meet you at the airport, tranfer you to your accomodation and be ready and waiting to drive you to your first tee-time, no need to worry over travelling times, traffic or directions.Your driver can assist with places to visit and where to eat and evening transport can be included too. When staying in St Andrews it is possible to play Gleneagles, Carnoustie, The Old Course, Kingsbarns and Muirfield although Royal Dornoch & Castle Stewart in the Highlands would require an overnight stay with perhaps a departure from Inverness Airport. 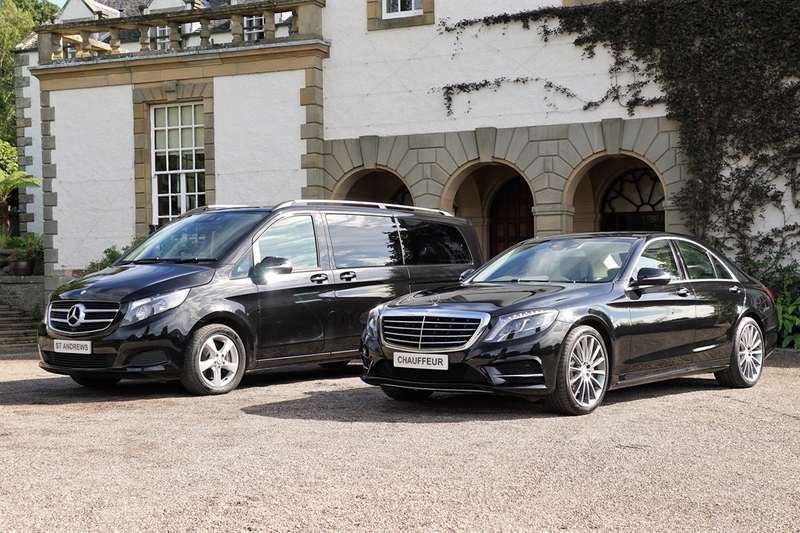 Airport Transfers from Edinburgh Airport to St Andrews - Inverness, Dundee and Glasgow Airport - your personal chauffeur will be ready and waiting to transport your party between airports, hotels, courses, excursions and restaurants as you wish. Often no more expensive than an airport taxi our Airport Chauffeur Service offers a superior vehicle and service level.